Do you have the whole week of Thanksgiving off, or do you have to teach for a few days? I’ve got this week and one and a half days next week to get through before Thanksgiving break, so I’ve been jam packin’ my days with everything and ANYTHING Thanksgiving! Now, truth be told, Social Studies is like the red headed stepchild in 3rd grade, so I jumped at the chance to integrate Native Americans, Early Settlers, AND the first Thanksgiving into my reading block. Three birds with one stone, yes, please! I am sure Scholastic designed their interactive lessons to last longer than a week (there is seriously soooooo much stuff up there!) But, I modified it down to meet what we needed in our little third grade world. We started with Pilgrims. I know that seems a little backward because the Native Americans were here WAAAAYYYY before Europeans, but you’ll see my reasoning behind in a minute. To, “hook” my thirds, I had them close their eyes and think about things they could freely enjoy. Playing outside, going to school, even going to church. After a brief discussion of what freedoms they were thinking about, I had them imagine not being allowed to do those things because of their religion. The horror on their faces! Then, I likened that to the Pilgrims and why they fled England. Now that we primed and ready to learn (and totally full of empathy for our Pilgrim ancestors) I read a little bit from the book, “If You Sailed on the Mayflower”. These are a great series of books if you haven’t checked them out! Then, we were finally ready to jump into those interactive pieces on Scholastic’s website. We took a tour of the ship and learned more about the Mayflower’s rough journey through the interactive map. Scholastic also has a downloadable PDF of the Mayflower Compact, so we took a gander at that as well! On Tuesday, we were ready to learn more about life for the Pilgrims after landing in the new world. We read a few more chapters, then explored the “Daily Life” section of Scholastic’s website. After discussing the similarities and differences between the English and the Wampanoag, we filled out a mini Venn diagram and used it as a basis for a compare and contrast paragraph. We just glued our mini diagram at the top of the page in our Reading Response Journals and use the lined spaced below to write. You can find this sweet little Venn diagram as part of Lori’s pack, from the blog, Lori’s Page, here! No Thanksgiving lesson plans aren’t complete without at least one turkey craft, we read the book, “Twas the Night Before Thanksgiving”. Don’t have the book? You can check out a video of the book right here! After reading the book, we brainstormed other foods we would like to have other than turkey for Thanksgiving. Remember folks, I teach real children in a real classroom, so most of our brainstorms are written on my trusting whiteboard while I’m doing the lesson. Don’t you just love the suggestions of ding dongs and cheesecake?! After we brainstormed, I sent students back to their seats and had them use this little graphic organizer from my, “No Turkey? Persuasive Writing” pack. Once the brainstorms were ready, we were ready to write a persuasive piece convincing our reader NOT to have turkey on Thanksgiving, but some other delectable dish instead. When they were done, the kiddos checked over their writing using a little self checking rubric. and it was time to publish! Who doesn’t love mom’s mashed potatoes? Tomorrow we’re learning about how Thanksgiving became an actual National Holiday thanks to Sarah Hale. Now, later this week, we have to take a mid-term reading assessment. Florida recently changed over from FCAT to FSA and testing resources are scarce (probably because the tests haven’t been officially written yet!) But, to get a summative grade for reading comprehension, I made this little 16 question FSA style assessment. Of course, the main theme is Thanksgiving! Please note this file is not “locked” and can be edited. All articles are pulled from the website, “ReadWorks.com”. Some questions are pulled from there as well, while others are ones I created based upon the FSA specs we were shown at the beginning of the year. Please feel free to use this assessment as you wish! Like this assessment? 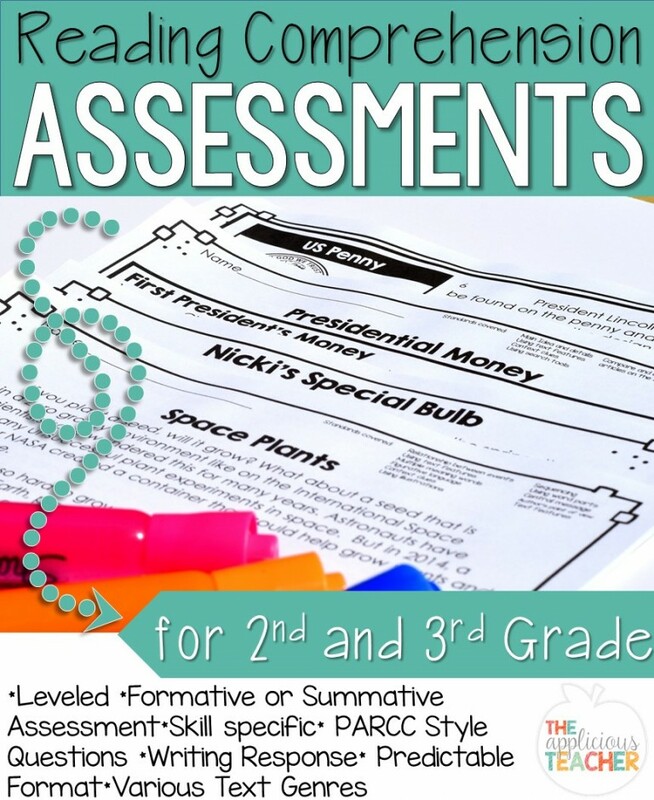 Check out my third-grade reading assessments here! Thanks for the list of resources! These look great! Hi. Thank you so much for all of these ideas. Can you tell me how to access the assessment? I clicked on the picture but it only gives me the first page on the dropbox.